Hiking is one of the most popular summer activities in Austria and you can start directly from our chalet. 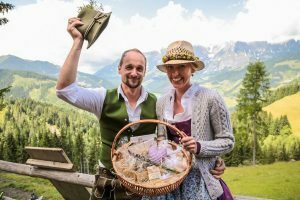 The Hochkönig region boasts 340 kms of a well signposted network of hiking paths with a variety of difficulty levels, durations and themes (such as hiking paths to discover local herbs). The 73 kms long Königsweg hike is the most popular multi-day route in this region. When hiking in the Hochkönig region, each step leads you deeper into nature. Fresh mountain air, towering rocks, idyllic hill farms, lush meadows and legendary views of the Alps. There are ‘Almhütte’ along the routes to relax and enjoy local Austrian delicacies. The Hochkönig Card, which is included in your stay, gives you free access to the ‘Wanderbus’ (Hiking Bus) and the summer cable cars. The Hochkönig region is the perfect base for leisure and professional cyclists. You can explore the region by mountain bike, road bike or e-bike along the many idyllic and enjoyable routes or demanding uphill and downhill stages. During summer you can take your cycle up the hill in the cable cars/lifts – free of charge with the Hochkönig Card – and experience the exhilaration of downhill cycling. If you are looking for a real mountain bike challenge, then head over to Bikepark Leogang. Bikepark Leogang is one of the first and largest bike parks in Europe and will be hosting the UCI Mountain Bike Downhill World Championships for the second time in 2020. The Hochkönig region is the forerunner when it comes to e-bikes. As the first region in the world to do so, it has a network of e-bike charging stations in the valley and on the mountain. On specially designated e-bike routes, you don’t have to worry about running out of battery power. Sports shops in Mühlbach rent mountain bikes and e-bikes. The Hochkönig is 2,943 m high. Its size is massive in every respect. It’s not without good reason that the Hochkönig has a legendary reputation among mountain climbers. Among the pros, it ranks up there with the climbing Eldorado of the Arco (Italy) and Chamonix (France). From amateur mountaineers to experienced climbing enthusiasts, there is something to make every climber’s pulse race faster with excitement. The variety of ascents and routes up to the highest of difficulty levels make the Hochkönig a climbing paradise – the Hochkönig reveals its most beautiful side when it comes to via ferrata climbs, high alpine routes and exposed summit tours. Dachstein Massif in the Schladming-Dachstein region also has plenty of climbing tours, via ferrata routes and signposted glacier hikes. Fancy soaring across the valley and mountains up in the sky like a bird? Paragliding will let you stretch your wings and experience the alpine world from above. You do not need any prior experience with tandem paragliding. Your pilot will ensure you have a wonderful experience. Depending upon the weather and wind conditions you can fly in different places across Hochkönig. Relax, Rejuvenate and Pamper yourself at the Thermal Spas or take a dip to cool off in one of the many swimming pools or mountain lakes in the surroundings. Mühlbach, where Wanderfalk Lodge is located, has a small heated outdoor swimming pool, separate kids pool and a sun-bathing area. With a 40 m long water slide, flume, floor bubbles, dousing shower, bench with massage jets, children’s pool, paddling pool and children’s playground, the Sommerstein adventure pool in Maria Alm also has plenty to discover. Access to these pools is complimentary with the Hochkönig card. Among the most beautiful mountain roads in the world, the Grossglockner High Alpine Road is open between May and October. Gorgeous waterfalls, beautiful flower meadows, several 3000 m peaks and the ever impressive Grossglockner towering over the entire region at 3798 m makes this alpine road a must do for all car and motorbike enthusiasts. This 48 km mountain road with 36 turns leads you deep into the heart of Austria’s largest National Park. Kaiser-Franz-Josefs-Höhe view point is a must visit. It offers the best view of the highest mountain in Austria and the 9 km long Pasterze glacier, longest glacier in Eastern Alps. Golfclub Urslautal, a championship course situated on a plateau between Maria Alm and Saalfelden (25 minutes from the chalet). Wherever you are on the course, you have an unrivalled view of the ‘Steinernes Meer’ massif, surrounded by alpine meadows and meandering streams. Golf Sankt Johann, a 18 hole golf course with all the modern amenities, is located in St. Johann im Pongau (20 minutes from the chalet). There are plenty of activities to do with kids during summer at Hochkönig. Muhlbach am Hochkonig is named Mountain village of Animals. Visit one of the 6 free, publicly accessible Petting Zoos where countless animals are just waiting to be petted by guests of all ages. They have alpacas, pot-bellied pigs, pygmy goats, sheep, ponies, and much more. Or maybe experience milking a cow! Whether in the petting zoos, on the farms or in the wild, twice as many animals live here as residents. Toni’s Alpine Meadow Playground is full of numerous play areas for children. It can be reached with the Karbachalm lift in Mühlbach. You also shouldn’t miss out on a short hike with the whole family when going on an excursion to the Karbachalm. The surrounding hiking paths are barrier-free so that nothing will get in the way of a leisurely walk for parents with children and strollers. The adventure playground (Erlebnisberg) at Natrun in Maria Alm is a great place for children to climb, rock, bounce, dredge and let off steam. The Krimml Waterfalls are not only breath-taking, but, with a fall height of 380 metres, they are the highest waterfalls in Europe! Do not miss this impressive natural spectacle. Particularly recommendable: A hike along the 4 km-long waterfall path! Ice Cave Eisriesenwelt in Werfen is the worlds largest ice cave. Awaiting you here are giant ice sculptures, glistening crystal worlds, and million years old rock formations. In the Mining Museum in Mühlbach you will gain insight into the 5,000 year old mining tradition. Go on a tour of the mine on the narrow-gauge railway. Entrance is free with the Hochkönig card that the chalet provides. The Kitzloch Gorge is one of the most beautiful and impressive gorges in the region. The many small waterfalls, bridges, and small embankments make the gorge a first-class natural monument. Discover how water is converted into clean, renewable energy at Kaprun high mountain reservoirs. You will be impressed by the phenomenal technology and the trip with Europe’s largest open lift, the Lärchwand inclined elevator! 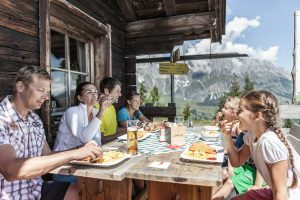 The hill farms and huts on the Hochkönig invite you to enjoy tasty treats while taking a break from hiking. As you savour Kaiserschmarrn pancakes or an alpine snack, take in the views and fill your soul too. Hochkönig is Austria’s only Vegan Certified region. 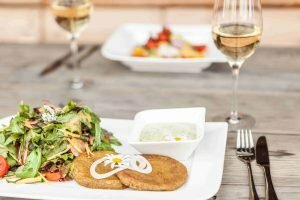 Select mountain huts, restaurants, hotels and bakeries serve Vegan food and drinks. At the Hochkönig herb hill farms, everything revolves around the treasures of nature. Taste homemade herbal treats such as juices, schnapps, spreads, or cheeses. Explore the Hochkönig Summer with us!